Taxidermy, by Alexis Turner, is (like The Empire Of Death, also published by Thames & Hudson) a beautiful and fascinating book about a morbid subject. It provides a history and taxonomy of taxidermy accompanied by hundreds of glossy photographs depicting historical and contemporary specimens, from the quaint anthropomorphic tableaux of Walter Potter to the macabre sculptures of Polly Morgan (Psychopomps) and Thomas Grunfeld (Misfits). Turner discusses taxidermy in natural history museums, interior design, contemporary art, and other contexts. 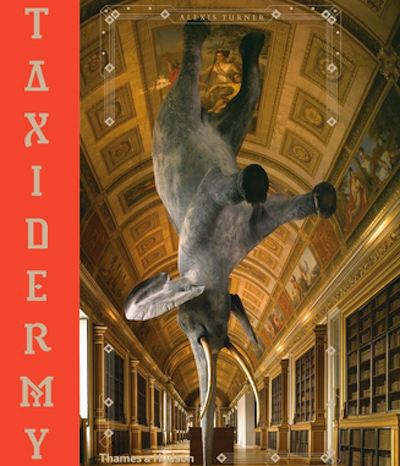 He summarises taxidermy's place in modern art too briefly, though, with no illustrations of works by Robert Rauschenberg or Damien Hirst, and no mention of Maurizio Cattelan. Surprisingly, there is no bibliography.